How long will it take for my episode to update in iTunes, Spotify (or other directories)? If your changes aren't showing up in iTunes, you should refresh your feed. You might wonder why some change you have made—like updating an image or posting a new episode—isn't showing up yet in iTunes, as this can be a source of concern or frustration. Pippa updates your feed immediately, as soon as you make any changes. And these changes will be available immediately to anyone who accesses your feed directly or any subscribers who refresh the feed. However, various players (like Apple Podcasts, Google Play, Spotify etc.) take a bit of time to process the changes on their side, as much as 24 hours. So, if you've published an episode, you see it in your feed, but it's not yet in iTunes (or wherever), it's most likely that they just haven't processed the change yet. 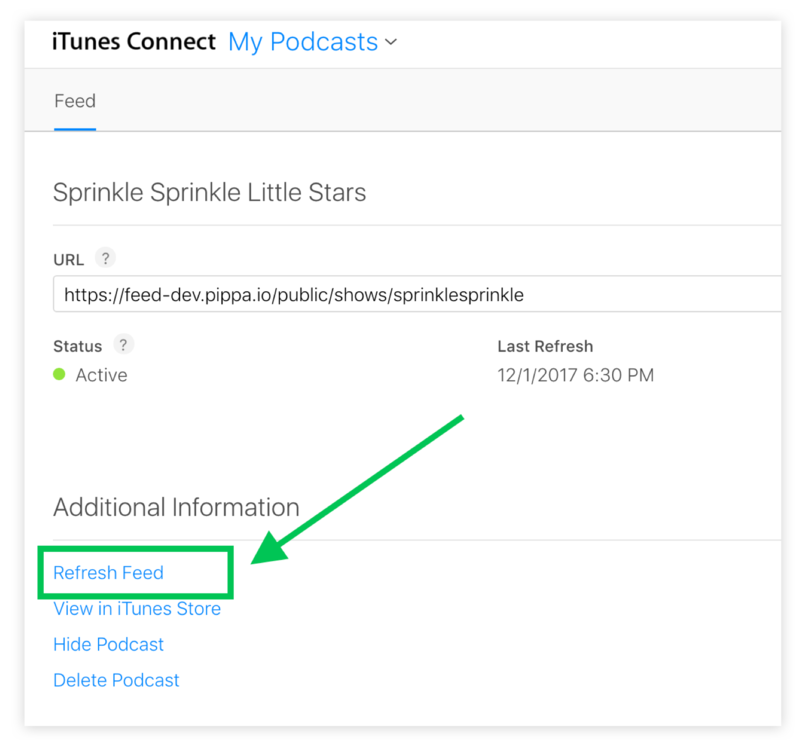 There is one way you can expedite this process: Refresh your feed in Apple Podcasts Connect. 1. Sign in to Apple Podcasts Connect and select the show you want to manage. 2. Hit the 'Refresh Feed' button. 3. Wait a little while—like an hour or two—and refresh your browser, iTunes, or the Apple Podcasts app. You'll likely see your changes reflected now.